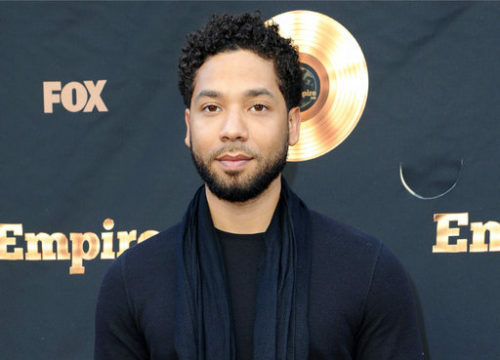 NEW YORK (AP) — While TV star Jussie Smollett was in the recording studio working on his own music apart from “Empire,” set for release later this year, he couldn’t help but write a song about what’s going in the world, from injustice to President Donald Trump. That’s when he penned “F.U.W.,” short for “(expletive) up world,” around President’s Day and immediately directed a music video to bring his words to life. The clip debuted late Wednesday on his YouTube page. “This song is for the oppressed. That’s why I feel like people will connect with it because it is very broad, because oppression is so broad,” he said in an interview Tuesday with The Associated Press. In another scene, a man in a wheelchair runs over a Donald Trump mask. “It’s our opportunity to take those masks off and shatter them, so that’s what I did,” he added. On Wednesday, Trump fired back at rapper Snoop Dogg days after the release of a music video in which he points a toy gun at a clown dressed like Trump and pulls the trigger. The White House did not immediate return a request seeking comment about Smollett’s video, which also features a black man standing in front of a noose, images of barbed wire and two water fountains with “white” and “colored” signs above them. During the presidential campaign, Smollett and other “Empire” cast members appeared in an ad endorsing Democratic nominee Hillary Clinton. Smollett, who was one of the kid stars of “The Mighty Ducks” film, is set to appear in Ridley Scott’s science fiction film “Alien: Covenant” this year. He said it was “freeing” to release a song apart from his “Empire” persona, and he challenged himself by directing the video. “Because the song means so much to me and the message means so much to me, and what we’re going through right now means so much to me, I wanted to do it justice. And I knew what was in my mind would do it justice,” he said.